Step out of the concrete jungle into a realm high in the mountains where you can learn about rare plants their fast-disappearing environment. Take in breathtaking mountain views surrounded by diverse vegetation and hidden floral gems that disappear into the clouds. 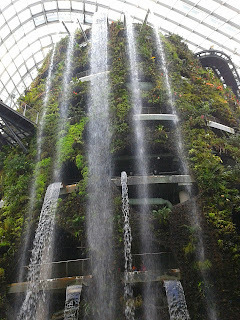 A 35-metre tall mountain covered in lush vegetation shrouding the world’s tallest indoor waterfall showcases plant life from tropical highlands up to 2,000-metres above sea level. © Copyright 2008 maejj.blogspot. All Rights Reserved. Picture Window theme. Powered by Blogger.